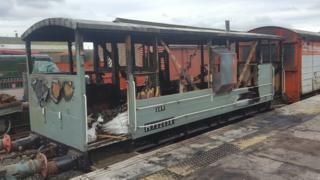 A recently restored 1940's brakevan at a volunteer-run Angus railway has been destroyed by fire-raisers. 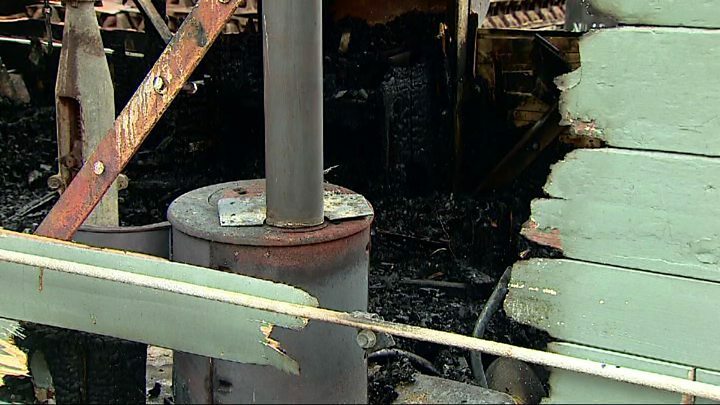 Caledonian Railway said the cost of the damage to the LMS brakevan at its Brechin station could be as much as £25,000. It said last night's blaze was a "huge blow" to the volunteers who operate the railway. Dundee Museum of Transport said the incident was "stomach-churning" and offered support "in any way we can". Caledonian Railway runs steam engines and diesel locomotives between Brechin and Bridge of Dun. In a statement posted on social media it said: "The wooden body of our recently restored 1940's LMS brakevan was set on fire and has unfortunately been completely destroyed. "This has been a huge blow to the volunteers who operate the railway and costs of the damage are estimated to be in the range of between £20,000 and £25,000. "Details on damage to the vehicle's underframe and the culprits behind this are still being collected and we would like to thank the police and fire and rescue service for their assistance. " Dundee Museum of Transport posted: "As a trust, we are extremely disappointed at the lack of respect shown towards the restoration and work that goes into the preservation of our transport heritage. "We hope the culprits behind this abhorrent attack are caught. "It's stomach-churning to think we have absolute fiends in our society that would carry out such an unprovoked and pointless act." A police spokeswoman said: "Police Scotland is appealing for information after a fire at Caledonian Railway, Park Road, Brechin yesterday evening. "The carriage of a train was damaged sometime between 10.45pm and 11pm."